Could These 5 Fast-Food Recipes Help You Save Money? You’re tired, broke and hungry, and someone asks “what’s for dinner?” Pulling into the nearest fast food drive-thru window is probably a no-brainer. After all, you’ll save yourself the trouble of going to the grocery store and cooking a meal, and it’s cheap, right? Well, maybe not. Fast food is often the go-to option for a quick and cheap meal, but over the years it seems like it’s quietly become less and less affordable. While it’s likely still less expensive than a typical sit-down restaurant meal with a tip, fast food can actually be comparatively costly and isn’t usually very filling. As part of my New Year’s Resolution, I wanted to make sure I was spending responsibly in all areas of my life, including my food. So I decided to find out: Was I really saving money by eating fast food? To find out, I planned to replicate meals from McDonald’s, Burger King, Taco Bell, Subway and Wendy’s. Each recipe below makes one serving, but I needed to feed two people (my fiance and me), and I went for variety, so we wouldn’t have to eat burgers for five days in a row. I also limited myself to meals I could make relatively quickly, since one of the biggest draws of fast food is the time you don’t have to spend over a stove. Keeping in mind that some ingredients last for multiple meals, I compared the cost of buying items at the grocery store to ordering the finished product at a fast-food restaurant. Note: These prices are pre-tax and can vary by region. When I buy a pound of meat, I typically break any I won’t use immediately into quarter-pound portions. I wrap them in plastic wrap and aluminum foil, then toss them in the freezer. That way, I’ve already measured out my portions, which saves me time when I start cooking. So to prepare this meal, I just had to cook the hamburger patty, cut and saute the onion, and bake the fries for 20-25 minutes. For about 25 cents more per serving, I could have bought beef that was already formed into patties, and for about 35 cents more per serving, I could have used frozen, pre-cooked hamburgers to save even more time. Either way, it took about 25 minutes to prepare the meal; for most of that time I wasn’t actively cooking, but staring at the oven waiting for the fries to bake. To assemble my burgers in the perfect McDonald’s way, I layered cheese/burger/cheese before adding the condiments, onions, and pickles. I salted the fries to my liking, and we were ready to eat. The chicken breasts I chose were precooked and frozen, so they only required about 25 minutes to bake in the oven, which was conveniently the same amount of time as the fries. There was very little actual cooking required here. Taco Bell is one of the great loves of my life, but looking at these numbers tells me I need to work on my addiction. As I said before, I pre-portion and freeze meat, so to cook this meal, I pulled out one of my ¼-pound portions. After browning the meat in a pan, I added the taco seasoning. I warmed my tortillas in the oven for about 10-15 minutes at 350 degrees. If I had been pressed for time or extra hungry, I could also have wrapped them in a paper towel and microwaved them for about 30 seconds. With the cooking done, it was just a matter of assembling the tacos however we wanted. I’ll probably still indulge in a Taco Bell bean burrito every once in a while, but it’s easy to see that making my own version at home is a much better idea. The chicken would take about 20-25 minutes in the oven. I cut corners wherever I can to reduce cooking time, so I decided to get a pack of fully cooked bacon. I wrapped the slices in a paper towel and microwaved them for about 45 seconds, though I could also have pan fried them like regular bacon for a little more crispness. As soon as the chicken was done, I put it on the sub and let the cheese melt on top. Then I added the rest of the ingredients, and it was ready to eat. This cooking-at-home thing was getting easier and easier! Once again, the chicken took about 20-25 minutes in the oven. I was shocked to find a can of corn that was already fire-roasted, and I doubt I could find it in every store. But if I hadn’t found it, I could have warmed the corn on the stove. I tossed the bacon in the microwave, wrapped in a paper towel, for about 45 seconds. Then I cut the tomato, bacon and chicken into smaller strips and mixed all the ingredients together to enjoy a delicious, homemade salad. In every case I tried, it worked out cheaper per serving to buy ingredients at the grocery store and make my own version of these meals. However, several factors could have changed the outcome. For example, I based my experiment on combo meals; if I hadn’t included the drink and side of fries, the costs would have been different. Also, using more or fewer toppings could affect the results either way. I like minimal condiments, so in the future, I might cut down on those while maybe adding an extra slice (or three) of cheese. This ability to customize my meal is one benefit of eating at home, though I’d have to be careful not to add too many extras (and extra costs). If we’d bought the meals at their respective restaurants, my fiance and I would have spent about $64. Buying groceries to make these meals cost about $60. It also meant we had many leftovers to use for other meals, which helped us save money later in the week. And that number included buying new condiments, when we generally always have ketchup and mustard in our fridge. Not everyone is able to make dinner at home every night and stop hitting the drive-thru altogether. When I was growing up, my mom waited tables, and we often lived shift-to-shift rather than paycheck-to-paycheck. When you’re working on a daily budget rather than a weekly or monthly one, fast food can seem like the best option. Knowing that real ingredients ultimately cost less, though, has helped my fiance and I make different decisions about the way we buy and eat food. I still find comfort in my old standby fast-food meals, and to be honest, sometimes it’s nice to have someone else make you dinner after a long day. But we’ve made an effort to make fast food a much smaller part of our diet. Make-ahead meals and leftovers are our best friends when we’re too tired to cook, and as I’ve learned, making our favorite fast-food meals isn’t so hard. And if someone who has (literally) burned water and set the stove on fire (three times!) frying okra can make these meals, you likely can, too. 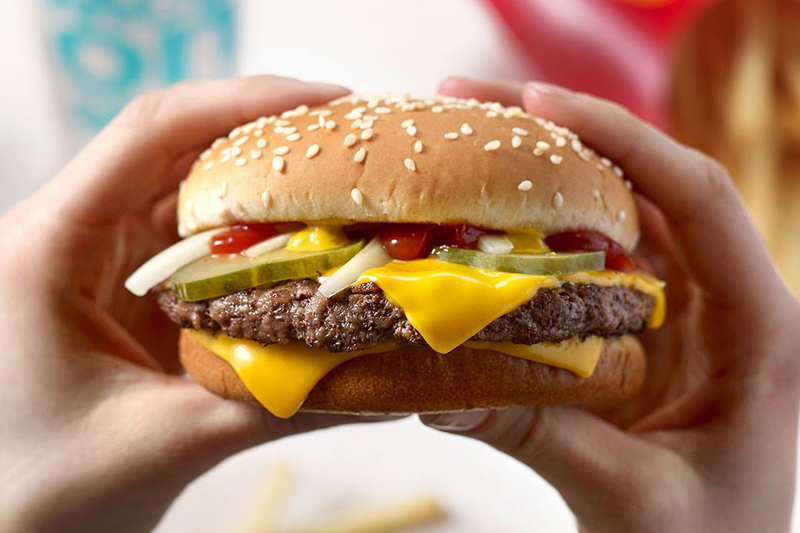 Your Turn: Have you ever tried to recreate your favorite fast-food meal? How did it go?